After having trapped at this location several years ago, I later found the source of the cats... an older apartment complex across the street. Setting out to trap 25+ cats at the apartment where they were being fed I encountered the husband of the caregiver. He refused to let me TNR the cats because he wanted them removed. What a disappointment after I had seen at least four mothers nursing newborn kittens on the small patio. I sat in the parking lot and cried that night. Forward one year...The complex was being torn down for development into "high-end" condos and residents were being evicted. This was the height of the real estate boom and the owners were hoping to make a killing on the property. Feral cats just did not "fit in" with lofts. A trapping friend who lived nearby alerted me to this situation and she and I decided to try again. The caregiver was still coming to the apartment to feed despite being banned from the property. The apartment windows were shattered and the place was abandoned. Of course now all the newborn kittens I'd seen earlier were breeding adults. We trapped quite a few in the oleanders behind the complex. Then about 9:00 PM we decided to go on the small enclosed patio and discovered numerous covered cat beds. These were cat condos! At least fifteen cats scattered as we approached. 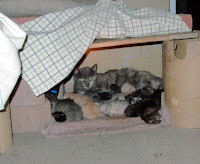 Looking under one covered bed we found a dilute tortie nursing 23 kittens! Ages ranged from 1 week to 2 weeks. What a nightmare. Well, to make a long story short, we rounded up a set of industrial two foot-long tongs from the property owner and carefully one by one plucked the kittens from the mother and into a box. Just as the last one was taken out, the mother bolted (Suzie and I trapped her eventually with the drop-trap). All the kittens went to bottle feeders that night and most survived and found homes through a local rescue group. Susie and I later trapped most of the remaining cats. However, those we did not catch ended up at the place I trapped on 8/1. This was the person I had trapped for earlier and we now provide her food to feed the additional cats from the apartments. By the way the condos never materialized due to the economic downturn. The apartments now have new tenants and there are cats still hanging out in the oleanders...but most of the ones I saw were ear tipped. Feeding feral cats and not fixing them is, in my opinion, animal cruelty. Unless fixed, fed cats will breed more often and have larger litters. Truly "feral cats" have fewer litters and fewer kittens per litter resulting in smaller colonies. Not fixing ALL the cats , especially the females, causes the remaining females to go into heat sooner so as to maintain the colony size. "Culling" kittens from a colony has the same affect on the mothers. This phenomena is supported by scientific evidence. So if you are feeding feral cats, please spay and neuter them. Do not feed them if you are not going to fix them. Contact the Spay Neuter Hotline TNR program at 602-265-7729 (SPAY) for assistance. That is an amazing picture. This antecdote explains so much of the problem. Thanks Pam! You're amazing, too.